Many cats are lactose intolerant. A lactose intolerant cat will usual have diarrhea when fed milk. A lactose tolerant cat can also become more intolerant over time because they aren't really built to digest cow's milk. If Chico's litter habits happen outside, she may have bouts of diarrhea without your knowing about it. Even those cats that can digest cow's milk really shouldn't due to the the fact that it has very high amounts of carbohydrates. Overall, it's best not to feed cats any dairy products, even those like Cat Sip that have the lactose removed. In the wild, cats get almost all of the moisture they need in the food they eat. That's one of the reasons why dry kibble is so bad for them. They have a very low thirst drive because most domestic cats are descended from desert dwelling wild cats. Jim, your best bet is to feed Chico a high quality wet or raw diet supplemented with fresh, clean water that's changed daily. We wish you and Chico all the best! We continue our series of recommendations for new cat owners. See the entire new cat shopping list here. The most important thing your cat needs is healthy food. There's a lot of debate over which commercial foods are the best. The one thing that's hardly ever debated is the fact that all cats do better on a wet food diet. Simply avoiding dry kibble gets you halfway to the finish line! Raw food diets are also becoming more popular because they more closely emulate what a cat would eat in the wild. Our highest recommendation goes to raw foods. There are several good frozen raw foods that make this easier than it may seem at first glance. The FDA has recently been targeting these companies and have even driven Rad Cat, our previous recommendation in this category, completely out of business. As an alternative, there are a good number of freeze-dried raw diets on the market. Despite what these may say on their labels, it's important that they be rehydrated prior to feeding them to your cat. It's a simple process. Just measure out the amount you intend to feed and add fresh water. You can crush the nuggets for a pâté texture or leave the nuggets intact for cats that prefer that. 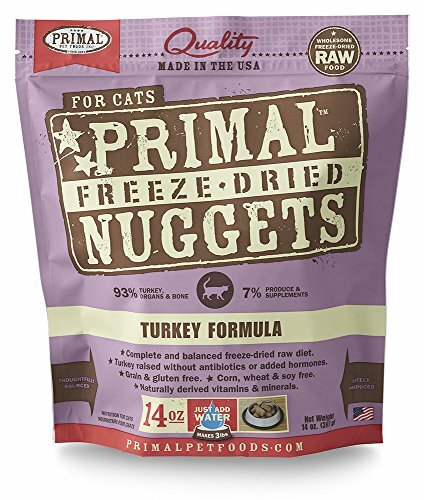 Primal Freeze-dried Nuggets are our number one choice in this category. Of course, you can also mix up your own raw diet with meat you purchase from the grocery store. Just know that the meat alone doesn't include sufficient nutrition. You need to add a feline supplement like Wysong's Call of the Wild powder. The Amazon listing refers to this as a supplement for dogs, but rest assured that it's designed for cats as well. Our next category is high-quality, canned food. Avoid those brands that you see on the shelves at the grocer, and even most of the ones that the big pet supply stores stock. You'll need to examine the ingredients as thoroughly as you would for your own food. The main ingredients should all be clearly listed as meat (not meat by-products) and any non-meat ingredients should be far down the list. 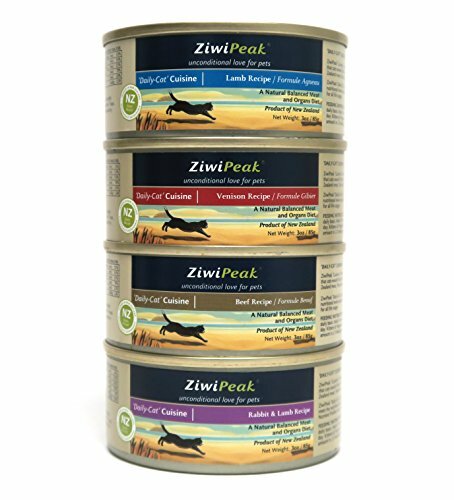 Our number one canned food recommendation is Ziwi Peak. It's almost as good for your cat as a raw diet. Unfortunately, it's made in New Zealand and that adds to the cost for those of us who don't live down under. A close second in the canned category is Nature's Variety Instinct line of canned foods. 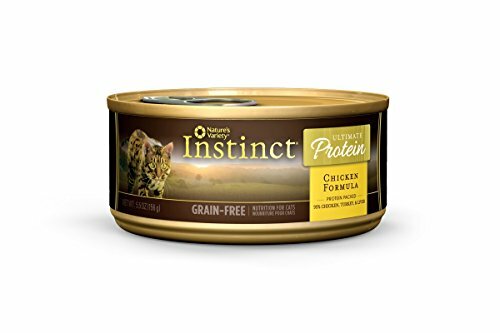 By far, our favorite, and our cats' favorite too, is their chicken formula, which is used in both their Ultimate Protein and the regular Instinct line. That's right, Nature's Variety confirmed to us that both foods are exactly the same recipe with different labels and that they should be priced the same. The first four ingredients are chicken, turkey, chicken liver, and chicken broth. This food has the advantage of being available in both 3.5 oz. and 5.5 oz. sizes, unlike Ziwi Peak. It's also widely available at a lower price than ZP. 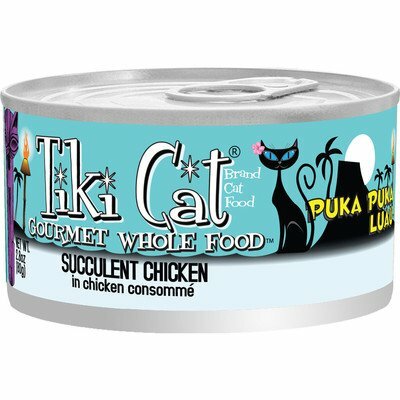 We also recommend the Tiki Cat varieties that don’t include fish ingredients. The Succulent Chicken flavor is especially enticing to many kitties and is readily available at most Petco stores. We would be remiss if we didn’t also add a widely available budget food recommendation. 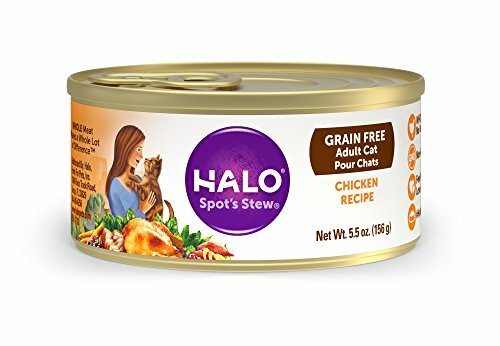 The best low-cost wet food we’ve been able to find is Halo’s Spot’s Stew line of canned cat food. While we do not recommend the fish varieties, the others are quite good with whole meat and no GMO ingredients. The only downside to these foods is the inclusion of salmon oil, but it’s the next to the last ingredient in most of their formulas. This is a very good canned cat food, and one you should definitely consider if you’re on a budget. You'll soon learn that many of the more deceptive pet food manufacturers have clever ways of spinning the cheap ingredients they use as fillers. Many cat foods have "grain free" on their labels, but still include large amounts of other non-grain fillers like potatoes. I seriously doubt that any sane cat would ever do anything more than play with a potato, so why is it included in their food? It's included because it's cheap! The more wary you are of these deceptive practices, the better choices you can make for the cats who're depending on you. Many cats love fish flavors but they would rarely eat fish in the wild. The fishy flavor can be so strong that it spoils a cat for any other foods. In addition, many cats develop allergies to fish proteins. In our opinion, it's best to avoid fish ingredients altogether. Be sure to check with your veterinarian to find out what their suggestions are for your cat. If you'd like to dig deeper into what's best for your obligate carnivore, check out CATINFO.org, an amazing cat food information resource created by Dr. Lisa Pierson, DVM. Another excellent resource is from the Cat Care Blog's list of Today's Best Cat Foods. They've studied a lot of the commercially available foods on the market and present their results for all to see. While these aren't comprehensive resources (no resource ever is), they can certainly give you a good head start when it comes to choosing foods for your feline. Don't forget to pick up some healthy treats! These can be useful as a training tool as well as a great way to get your new roommate up and about at playtime. Choose something that's as close to 100% meat as possible. 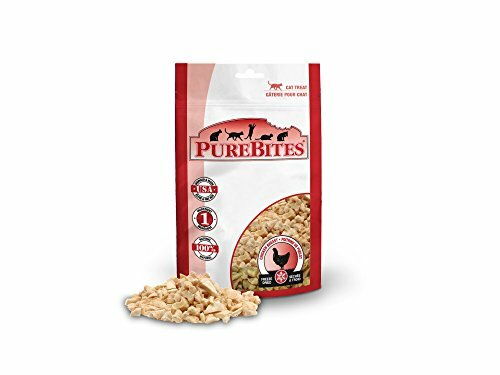 We particularly like the freeze-dried meat treats made by PureBites, and our cats do too! Also included in the treats category is catnip and cat grass. Cats normally consume this kind of roughage in the wild, so it's perfectly safe for them, however it is possible to overdo it. When choosing catnip products, try to find the ones that are 100% organic. We recommend Meowijuana products. Yes, you read that right. Meowijuana produces some of the best catnip products around! The pet food industry frequently engages in deceptive marketing practices. Many pet food companies are better at producing attractive packaging than they are at making nutritious cat food. If you’d like to stay on top of the goings on in the industry, we suggest subscribing to the newsletter from Susan Thixton’s site, Truth About Pet Food. You can also join the Association for Truth in Pet Food for a modest donation. We strongly support the work Susan is doing with her watchdog organization and are hopeful that it will help make our cat food choices even more clear in the future. We do not offer medical advice. If your feline friend has a medical issue, the best thing you can do for them is to take them to a good veterinarian. All critical health decisions should be made with the input of your veterinarian. We include affiliate links to Amazon products in some posts as a way to offset the costs of running KHD. If you click on one of the links and decide to buy something, KHD can receive a small commission without affecting the price that you pay. Thanks for supporting KHD! all site contents copyright Kitty Help Desk. Meow.